The euro was the loser in week that saw the dollar retreat and make a comeback. The first week of the new month is packed: rate decisions in Australia, Canada, the UK and the euro-zone, GDP data from Canada and Australia and a full buildup to the US Non-Farm Payrolls. These are the main market movers on FX Calendar. Join us as we explore the highlights of this week. Janet Yellen managed to send mixed signals and was analyzed as dovish. However, was she preparing us for the removal of forward guidance? Her colleague Bullard was quite bullish. US data came out mixed: jobless claims rose to 313,000, and CPI declined 0.7% due to continued slide in oil prices, while Core CPI surprised with a 0.2% rise and maintained a stable 1.6% y/y figure. The latter number trumped the others and allowed the dollar to make a comeback. In the euro-zone, the Greek list was approved and the crisis is off for now. Data has been somewhat upbeat. UK GDP remained supportive of the pound while in Australia, speculation mounts about an RBA cut. We’ll get lots of answers now. US ISM Manufacturing PMI: Monday, 15:00. Manufacturing activity in the U.S. expanded mildly in January, reaching 53.5, after posting 55.5 in December. The lukewarm reading raised concerns over the health of the economy. Economists expected a stronger reading of 54.9. New Orders declined 4.9 points to 52.9, Production Index was 1.2 points below 57.7 posted in December and Employment Index registered a 1.9 points decline to 54.1. 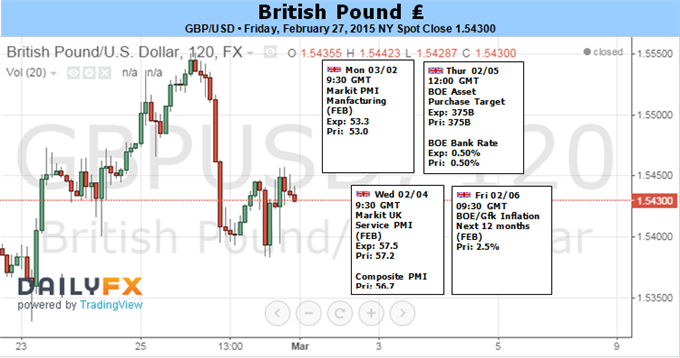 The headline number for February is expected to rise to stand at 53.4 points. Australian rate decision: Tuesday, 3:30. 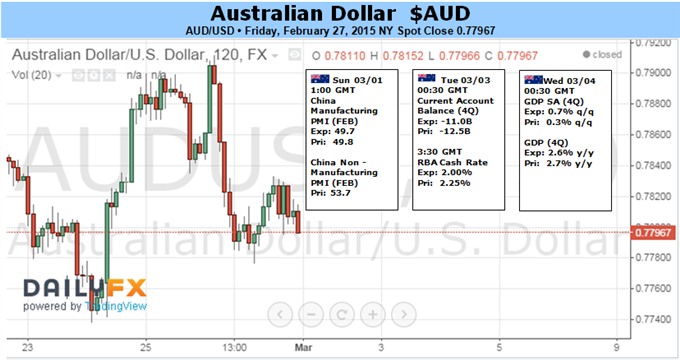 The Reserve Bank of Australia surprised markets in February with a rate cut of 0.25% to 2.25%. This was the first change since August 2013.The RBA noted that the recent drop in oil prices were not enough to boost growth and global economy is also expanding in a moderate pace. Inflation is expected to remain slow, domestic demand is forecast to weaken and the unemployment rate is expected to increase. We think that the RBA could cut again. Canadian GDP: Tuesday, 13:30. Canada’s economy unexpectedly contracted 0.2% in November, prompting talks of a second rate cut in six weeks. Economists expected a small decline of 0.1%. Sluggish activity in manufacturing, mining oil and gas extraction lead to this decline. The BOC noted that if economic data remain weak in early 2015, it could lead to another rate cut. On a yearly base, Gross domestic product grew 1.9%, the lowest year-on-year advance since the 1.9% of March 2014. A +0.1% growth rate is on the cards now. Australian GDP: Wednesday, 0:30. Australia’s gross domestic product grew by a mere 0.3% in the third quarter, reaching a 2.7% expansion, in the 12 months to September. Economists forecast a 0.7% growth for the quarter and 3.1% for the year. However, policymakers noted the GDP was only marginally lower than expected. Despite the rise in unemployment, exports are getting stronger and will lead to expansion in 2015. Expectations stand at +0.7% q/q. US ADP Non-Farm Payrolls: Wednesday, 13:15. The U.S. private sector added 213,000 jobs in January, missing analysts’ forecasts of 224,000. December’s private payrolls were revised up to 253,000 from the previously reported 241,000. Despite the weaker than expected data economists believe that the U.S. labor market is expanding at a solid pace. A similar gain of 218K is predicted now. Canadian rate decision: Wednesday, 15:00. The Bank of Canada surprised markets by cutting its key overnight lending rate by a quarter of a percentage point to 0.75%. The ongoing decline in oil prices posed a threat to Canadian economic growth. Bank of Canada governor Stephen Poloz said the revenues from oil exports will be reduced on top of sluggish investment and employment in the energy sector. The rate cut was aimed to rebalance the economy. The Central Bank also downgraded its growth forecast for 2015, from 2.4% to 2.1% and expect a mere 1.5% growth in the first six months. US ISM Non-Manufacturing PMI: Wednesday, 15:00. The U.S. services activity remained strong in early 2015 but employment slackened. ISM non manufacturing purchasing managers index reached 56.7 in January, nearly unchanged from 56.5 in December. Analysts expected the index to reach 56.6. The majority of responders were positive towards business conditions. The new orders index increased to 59.5 from 59.2 in December. Business activity edged up to 61.5 from 58.6 but the employment component declined to 51.6 in January from 55.7. A similar figure of 56.5 points is on the cards now. UK rate decision: Thursday, 12:00. Bank of England policymakers voted unanimously to keep rates on hold in February but raised the possibility for the first time that it could cut interest rates below 0.5% if inflation weakens further. British inflation plunged to 0.3% in January, the lowest level since records began in 1989 and far below the BoE’s 2% target. The BoE noted it may cut rates below zero in the coming months. BoE policymaker Martin Weale said the bank will need to start raising interest rates sooner than investors expect as inflation recovers from current low levels. No changes are expected. US Unemployment Claims: Thursday, 13:30. The number of Americans filing initial claims for unemployment benefits edged up unexpectedly last week to 313,000, from 282 in the prior week. The 31,000 rise was the biggest jump since December 2013. Economists expected claims to reach 288,000. The four-week average increased to 294,500 from a revised 283,000 the week before. Chair Janet Yellen noted in her congressional testimony this week that there are still too many unemployed, wage growth is still slow and inflation remains well below the Fed’s objectives. US Non-Farm Payrolls report: Friday, 13:30. The US economy added 257,000 jobs in January, exceeding expectations of a 230,000 jobs gain, reconfirming the strength of the US economy. The economy has created more than 1 million new jobs in the last three months and the private sector has added 11.8 million jobs over 59 straight months of job growth, extending the longest streak on record. Wages in the private sector also increased, with a rise of 12 cents in average hourly earnings to $24.75. Over the last 12 month average wages have increased by 2.2%, up from a previous estimate of 1.9%. However, despite the increase in new jobs, the unemployment rate increased slightly from 5.6% to 5.7%. Economists believe the rise may be a result of the huge surge in the labor force increasing statistical noise, but can also reflect growing optimism about the chances of gaining work. Estimations currently stand at a gain of 241K, an unemployment rate of 5.6% and a rise of average hourly earnings of 0.2% m/m. US Trade Balance: Friday, 13:30. The U.S. trade deficit widened sharply in December reaching $46.6 billion 17.1% higher than in the previous month. . It was the biggest percentage increase since July 2009. The trade gap suggested a downward revision to the fourth-quarter gross domestic product. Imports increased 2.2% to $241.4 billion, and imports of non-petroleum products edged up to a record high, a sign of strengthening in the domestic economy and a strong US dollar. Exports declined 0.8% to $194.9 billion in December. A narrower deficit of 41.6 billion is on the cards now. The Dollar received a jolt of volatility this past week in a rally that followed the CPI inflation report, but the currency was unable to escape the bounds of a month-long range. It will be increasingly difficult to maintain a range going forward however. Not only are major themes like US rate forecasts and risk trends developing, but we have a range of high profile event risk. While US indicators like the February NFPs will provide a clear connection to Dollar activity; policy decisions by some of the Fed’s largest counterparts – the ECB, BoE, RBA and BoC – can generate considerable indirect force. 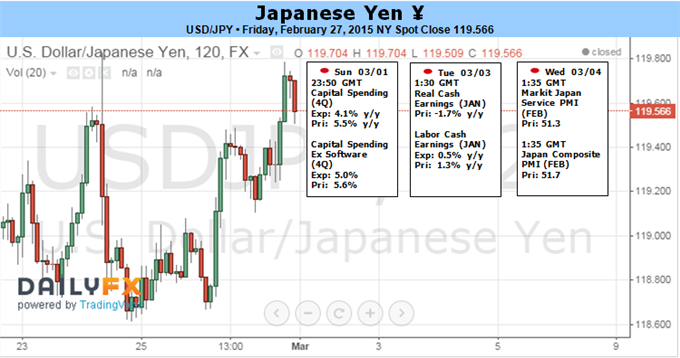 For Dollar traders, the outlook is steeped in two key fundamental themes: monetary policy and speculative sentiment. It is the former that has fed the Greenback’s bullish trend these past nine months (the ICE Dollar Index secured an eighth consecutive rally – a record- while the Dow Jones FXCM Dollar Index closed the month slightly lower). Yet, just as clear as the ‘relative’ hawkish outlook for the Fed has generated such a resounding performance, we can also see its limitations shaped through the month-long consolidation pattern the benchmark established through February. Compared to the ECB and BoJ (who are executing quantitative easing programs) or the RBA and BoC (which have recently cut their benchmark rates), the FOMC is exceptionally hawkish. Though it is still plotting the time frame for its first hike in a controlled normalization regime, a tightening move offers drastic contrast. Much of this has been priced in however. Currently, the market expects a first and second rate hike in 2015 – something the other majors cannot claim. To leverage further gains on this view though, the lead needs to be extended. According to Fed Fund futures, the first move by the Fed is expected around the October 28 meeting. Alternatively, surveys for economists, analysts and primary dealers pegs it around June 17 or July 29. That opens the door for more progress. A few particular data points stand out over the coming week that can up the market’s expected time frame – or push it back depending on the outcome. At the start of the week, we have the PCE inflation measures. Given that this is the Fed’s preferred price gauge, a surprise here could generate a greater market response than the heft Dollar bid that followed last week’s CPI release. At the end of the week, the February labor data will be a media and speculative focus. While the payrolls and jobless figure are important, we know the general trend of the past five years. The missing puzzle piece for hikes is inflation. And that leverages the importance of the average hourly wages component which last month posted the biggest monthly jump since December 2008. A change in tide and intensity of the US rate forecast is the most direct means to motivate the Dollar, but don’t write off the strengthening or weakening of its collective counterparts as a capable impetus. The ECB is set to activate its stimulus program while the RBA and BoC are expected to each supply a consecutive interest rate cut. There is plenty of room to broaden or close that gap. There will be plenty on the docket – and no doubt newswires – to occupy our attention in the week ahead. Yet, it is important to maintain a firm grasp of the ‘big picture’. The view of US monetary policy compared to its conterparts is a node, but how collective monetary policy influences global investor sentiment is a central pillar. ‘Risk appetite’ has not contributed much to the Dollar’s cause – bullish or bearish – recently as it has not moved with conviction (regardless of what it seems the S&P 500 is doing). It is difficult to instill confidence of a robust extension of already mature risk accumulation trends. In contrast, the correct spark can ignite an explosive value gap to risk aversion and deleveraging. When this reallocation hits, the Dollar will gain at the extremes. The Japanese Yen traded lower versus the US Dollar for the third week in four and left the USDJPY exchange rate near the key ¥120 level. Why might the week ahead finally bring a major breakout? Traders have shown little interest in pushing the Yen beyond its narrow three-month trading range, but any significant surprises in upcoming US Personal Income/Spending and Nonfarm Payrolls labor data could change outlook for the otherwise-rangebound USD/JPY exchange rate. A fairly consistent rally from January lows near ¥116 suggests that the next major USDJPY move will be to the topside. Relatively low trader volumes in recent weeks nonetheless limits our enthusiasm for fresh USDJPY-long positions, however. We would ideally see a major shift in market conditions and trader attitudes to justify calling for a sustained break higher.The key question remains unchanged: when will the US Federal Reserve begin raising interest rates? Yield-seeking investors have typically sold the Japanese Yen against higher-yielding currencies through normal rate environments. And indeed, the fact that the US Fed appears to be the only major central bank to act in 2015 has helped push the US Dollar to 8-year peaks versus the JPY. Expectations can only take the Greenback so far, and eventually investors will need to see action. Consistent improvements in US Nonfarm Payrolls figures suggest the coming week’s result will further build the case for Fed rate hikes. Yet fundamental risks seem weighed to the downside as few predict that hiring matched the impressive pace seen through January’s report. Technical forecasts paint a similarly mixed picture for the Dollar/Yen exchange rate, and indecision helps explain why recent CFTC Commitment of Traders data shows speculative JPY-short positions (USDJPY-longs) have fallen to their lowest since November, 2012. The Bank of England’s (BoE) March 5 interest rate decision may have a limited impact on GBP/USD as the central bank is widely anticipated to retain its current policy, but the fundamental developments coming out of the U.K. may continue to boost the appeal of the sterling should the data prints highlight an improved outlook for growth and inflation.Following the BoE testimony, it seems as though the Monetary Policy Committee (MPC) will continue to move towards a rate hike especially as Governor Mark Carney only sees a ‘temporary’ decline in U.K. inflation and retains the hawkish forward-guidance for monetary policy. With that said, a further pickup in U.K. Mortgage Approvals along with a faster expansion in the Purchasing Manager Indices (PMI) may boost interest rate expectations as a growing number of central bank officials show a greater willingness to normalize monetary policy over the near to medium-term. At the same time, the U.S. Non-Farm Payrolls (NFP) report will also largely be in focus as it remains a race between the Fed and the BoE as to who will be the first to normalize monetary policy. Indeed, another 240K expansion in U.S. employment may further the argument for a mid-2015 rate hike, but Chair Janet Yellen and Co. may ultimately share a similar fate to their U.K. counterpart especially as Average Hourly Earnings are expected to narrow to an annualized 2.1% in February. As a result, the disinflationary environment may push the Fed to further delay its normalization cycle, while a pickup in U.K. economic activity may underpin a larger rebound in the British Pound as the central bank continues to prepare households and businesses for higher borrowing-costs.Nevertheless, the lack of momentum to push and close above the former support zones around 1.5510-55 may produce range-bound prices in GBP/USD ahead of the key event risks, but the pair may make a more meaningful effort to retrace the decline from the previous year should the fundamental developments sway the interest rate outlook for the U.S. and U.K. As we open up the March trade, the opening monthly range may dictate the short-term outlook for the pound-dollar as the Fed is scheduled to deliver its next interest rate decision on March 18. The Australian Dollar spent a fourth week in consolidation having started the month with a drop to the lowest level in nearly six years against its US counterpart. That move was triggered by a surprise interest rate cut from the Reserve Bank of Australia, and prices have since stalled as investors weigh the possibility of further easing. The deadlock is likely to be broken in the week ahead as policymakers gather for another policy meeting. A survey of 29 economists polled by Bloomberg is narrowly leaning toward stimulus expansion, with 18 of those queried calling for the benchmark lending rate to be lowered by 25 basis points to 2 percent. Traders are bit more dubious: priced-in expectations reflected in OIS rates reflect a 56 percent probability of a reduction. This means that regardless of which direction the RBA opts to take, nearly half of investors will find themselves wrong and scrambling to readjust portfolios accordingly. Needless to say, this is likely to make for a volatile response no matter what outcome ultimately hits the wires. Whatever the initial reaction however, follow-through will be far from certain as high-profile event risk emerges on the external front and threatens to pull the Aussie into its orbit. February’s US Employment report stands out as particularly critical as investors continue to speculate about the timing of the first post-QE interest rate hike from the Federal Reserve. Expectations call for a slight slowdown in job creation, with payrolls posting a 235,000 increase compared with 257,000 added in the prior month. US news-flow has tended to underperform relative to forecasts in recent months, hinting economists continue to overestimate the vigor of the world’s largest economy and opening the door for a disappointing jobs figure. Such a result may pour cold water on bets calling for the onset of FOMC policy normalization by mid-year. That is likely to weigh on the US Dollar, offering a lift to the Australian unit that either cuts short weakness or amplifies strength seen after the RBA announcement, depending how Glenn Stevens and company ultimately decide to proceed. Gold prices snapped a four week losing streak with the precious metal rallying 1.27% to trade at $1216 ahead of the New York close on Friday. The fresh batch of central bank rhetoric from the Humphrey-Hawkins testimony suggests that the Fed remains cautiously on course to normalize monetary policy, but the fundamental developments due out in the days ahead may heavily influence interest rate expectations as the central bank struggles to achieve its 2% target for price growth. Beyond the slew of central bank rate decisions kicking off the March trade (RBA, ECB, BoE & BoC), the U.S. Non-Farm Payrolls report may have the biggest implications for gold on the back of the USD strength story. Despite the stronger-than-expected 4Q GDP print, the disinflationary environment may put increased emphasis on the wage growth figures due out on Friday, and signs of subdued household earnings may undermine the bullish sentiment surrounding the dollar especially as market participants anticipate Average Hourly Earnings to narrow to an annualized 2.1% in February. We’ll look for possible softness in the greenback to further support the recent gold rally with prices closing out the week just below key resistance. Last week we highlighted key technical support at $1196/98, a level defined by “the confluence of the 61.8% retracement of the November advance & the 1.618% extension of the decline off the January high and is backed closely by a basic trendline support off the November low. We’ll reserve this region as our near-term bullish invalidation level and although the broader bias remains weighted to the down-side, near-term this structure may offer stronger support. Interim resistance (near-term bearish invalidation) stands at $1218/24… Bottom line: looking for a low early next week with a general topside bias in play near-term while above $1196/98.” - Indeed the market fell to a fresh low on Monday before rebounding to test the $1218/24 resistance range. 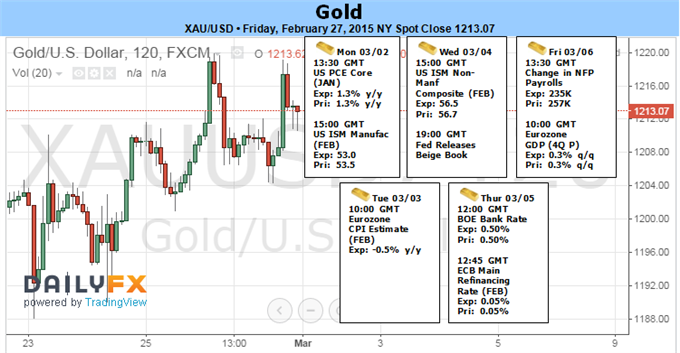 Our outlook remains unchanged heading into March with the 1196-1224 range in focus to start the week. A topside breach keeps the long-bias in play targeting resistance objectives at 1234 & 1248/50 with a break sub 1195 (close basis) risking substantial declines into subsequent support targets at $1171 & $1155. 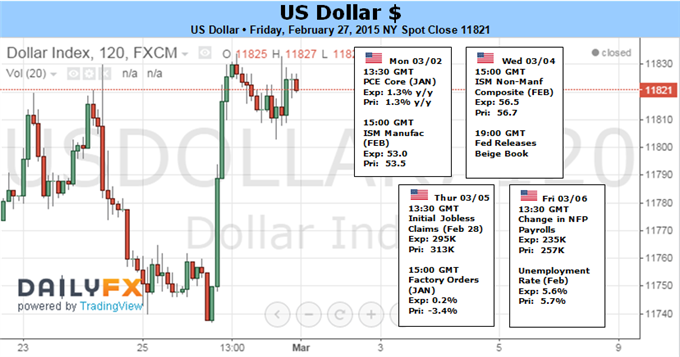 The EUR/USD posted an inside move and lower close during February. The chart pattern indicates impending volatility and trader indecision, but with a bias to the downside. The close at 1.1193 indicates the consolidation around the major Fibonacci level at 1.1211 may be over, setting the stage for a possible breakdown under the January low at 1.1097. During February, the market held up considerably well after Greece agreed to an extension of its bailout agreement with the Euro Zone. Some of the consolidation was a spillover from January when the European Central Bank finally announced the long-awaited stimulus plan. With the Euro Zone still facing growth issues, traders are still heavily short, so any bottoming action will likely be fueled by short-covering rather than aggressive buying. The European Central Bank should leave interest rates unchanged while allowing its stimulus to do its work so the main focus this month will be on the U.S. Non-Farm Payrolls report on March 6. A strong report will be bearish for the EUR/USD because it will bring the Fed closer to raising rates. Traders are currently pricing in a potential rate hike in June although Fed Chair Janet Yellen said late last month that the central bank was in no hurry to raise interest rates because of a struggling labor market and low inflation. Weak jobs data won’t necessarily be bullish for the EUR/USD, but it will encourage position-squaring and short-covering, but any gains will be limited. Technically, the main trend is down on the monthly chart. The close under the long-term Fibonacci level at 1.1211 indicates weakness. If a fresh round of selling pressure starts after the U.S. jobs report then sellers will go after the low for the year at 1.1097. Crossing to the bearish side of a steep downtrending angle at 1.10793 will put the market in an extremely weak position. The tone of the market this month will be determined by trader reaction to 1.1211. If this area holds as support and momentum gets strong then look for the short-covering rally to extend into at least 1.1687.